Yesterday I did the dorkiest thing I have ever done in my life. Well, at least the dorkiest thing I have done in the last 10 years. I have to qualify things because I have been known to be incredibly dorky. A few weeks ago, when the basement flooded, I was down there salvaging stuff. And one thing I salvaged was the United States stamp album I had as a kid. My world stamp album was upstairs already, not that I had opened it since I was about 12. When I found my U.S. stamp album I got mad at myself, thinking: Why is this thing in the basement? It should be upstairs where it's safe. So I brought it upstairs and now it is kicking around the house, with everything else. So I'm at work yesterday, and this envelope lands on my desk. You can see where this story is headed. I notice the stamps. They looked odd. What elegant stamps, I was thinking. They reminded me of the old stamps I had just seen in my old album -- monochromatic, on heavy, engraved paper. Old U.S. stamps were the best stamps in the world. Funny, I didn't know they still made stamps like this. All I can find at the post office now are garish stickers. Then I realize: The reason these stamps look old is that they are old! Three of the stamps were 5 cent stamps. That suggested, I instantly calculated, that they dated from the early 1960s. It is funny how arcane knowledge you amassed as a kid is still in there, instantly accessible. 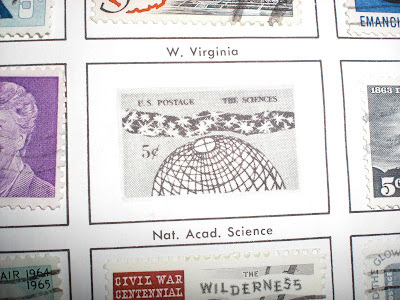 The five-cent stamps were green and bore a picture of a globe and the words "The Sciences." Another stamp was red, for 25 cents. It had a picture of an airplane. 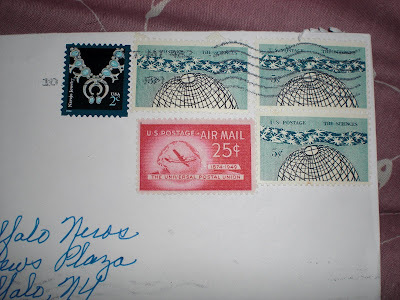 It was obviously an air mail stamp, and I was able instantly to determine it was from 1949. Think all this is nerdy beyond belief? Wait till you hear what comes next. Those stamps! My mind flashed back to them. I was alone in the house. No one would see me. I crept downstairs, and I ... ssshhhh .... began leafing through the album. And do you know what? I found the picture of the science stamp. It was right where my 10-year-old self had told me it would be, in 1963. And would you believe it, I did not have it!!??!! I had almost every other stamp on that page, including the Doctors Mayo and Homemakers, but I did not have "The Sciences." Whoo-hoo! This was great!! I flipped to the Air Mail section. Another score! I did not have that Air Mail stamp! I had others, but not that one. What a day! What a find! But now what? Will I have to go and get stamp hinges? I would have to put a paper bag over my head. Well, I will think about that tomorrow. For now, let it be known: I have two extra 5 cent stamps, "The Sciences," from 1963. Lightly canceled. I am keeping the one that is not. Anyone got anything good to trade?